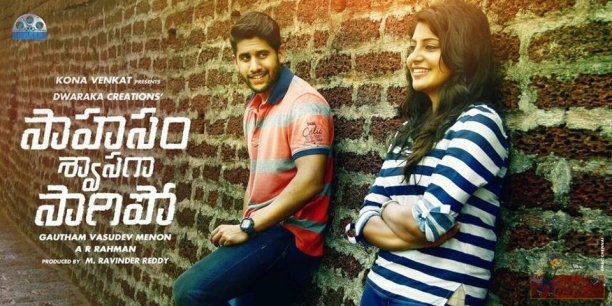 Naga chaitanya Sahasam Swasaga Sagipo, Achcham Yenbathu Madamaiyada Telugu, Tamil Movie Review. Movie got positive response all over. This is directed by goutham menon who directed venkatesh gharshana and em maya chesave with naga chaitanya. AR Rahman gave music to this movie. Manjima mohan and chaitanya acted as lead pair. Movie released today in around 600 screens and receiving average response. Verdict - First half is romantic and second is emotional and action oriented. Can watch once for goutham pleasant narration and if you have nothing to watch. 123telugu - Action filled romance. On the whole, Sahasam Swasaga Sagipo has some very interesting moments throughout and will impress the younger generation. But the lack luster and silly climax can disappoint many. However, this film ends ups as an okay watch only because of Naga Chaitanya who gives a superb performance and holds the film together. Rating - 3/5. Telugumirchi - After a hit like Premam, Chay did not want to risk anymore with his career anymore. Chay’s performance was cool enough and the story is good as well. It has a slow paced narration which irritates the audience but it’s okay for this kind of love story to have that pace. The love between the pair was good while Gautham Menon sounded to experiment things which might impress. Well, we never know what audience will love or hate. Rating - 3/5.